Garage Door On it's Last Legs? We've Got The Repair & Replacement Solutions You Need! Signals Your Garage Door Needs Repairs! If your door has been shaking or making more noise than normal, stopping suddenly, or behaving oddly in general, the culprit is likely worn out parts. The daily use of it takes its toll over time, particularly if no maintenance is done. Rusted or ground down parts are what causes these various issues with your door, and slows down your day! While you might believe there's no reason to take care of it right away, the unfortunate truth is that the troubles will only multiply if left untreated. It's best to get it taken care of, so you won't have to worry about even worse damage in the future. Allow Our Experts To Assist You! Whatever the trouble may be, you can trust that we can take care of it easily! That's what comes with skills that have been honed through years of work on garage doors just like yours. We use the best tools and parts to get your door back to being like new again before you know it. No matter if it has torsion or extension springs, rollers or cables, or whatever the brand of opener, we'll be able to repair or replace any of it! Our technicians will find the best fix for your door in no time, and you'll be on your way far faster than before. We do that as well! You never know when a bad storm or car bump may take your door out of commission completely. Even if you're unsure why it won't budge, that's okay! Just give us a call, and let us know that it's an emergency. We'll be over fast, and set to work getting it moving again. This way, you can get back to your pressing schedule with ease. Don't let your door ruin your day when we can help! 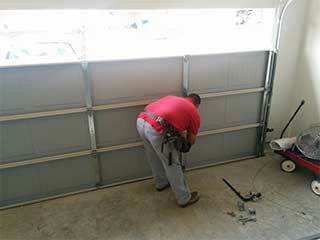 Contact Garage Door Repair Encinitas today.